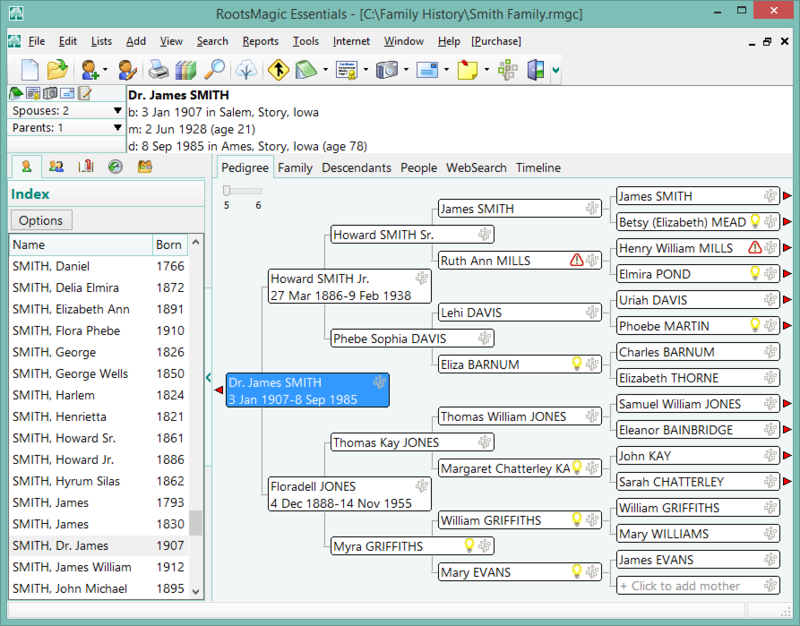 Window geneology program with visual trees for input. Genius for Windows Copyright (c) 1993-1994 by Peter Resch - All rights reserved. GENIUS for Windows is NOT FREE. You MUST REGISTER after the 60-day evaluation time period. moral obligation to register it with the author. time period you must register it. documentation files are distributed in their original, unmodified form. package which is sold or for which any licensing fee is charged. Welcome to Genius for Windows. and to use a computer industry word 'intuitive'. I hope I have managed to achieve that aim. describing Genius's operation in the manual and the Help screens. I hope you enjoy using Genius for Windows. and of course the currently selected person. select any person to view or edit their information. approximately 1 byte per character for each persons notes. An individually formatted data sheet for each person. A list of all people recorded with the same Family Name. less direct relationships are sorted out automatically. sub directory before you can install it. You will need to obtain this file (most BBS's have it). charge of $6.00 (in Australian Dollars). you wish to install Genius on your hard disk. directory that you want Genius to be installed on. directory, this is to store the family records that Genius will generate. you start your own family database. the files listed above from the sub directory 'FILES'. complexities of entering, viewing and printing data. Extensive Help is available by pressing the [F1] key. software that you have installed. Telephone support if you have any problems. Direct access to the program (the registration notices wont appear). A warm feeling knowing you have done the right thing. be able to continue from where you left off. Your data remains intact. East Coast USA (-15 hrs); 2pm to 11pm Pacific Coast USA (-18 hrs). and suggestions that I can incorporate in the next version. before installing or running Genius for Windowss.